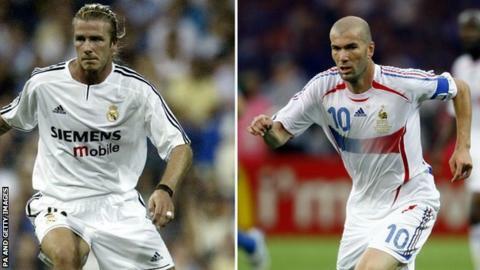 Will the new legends World Cup attract the likes of David Beckham (left) and Zinedine Zidane? A new World Cup for legends will take place in Mexico at the start of 2017. Twelve teams will take part - four from the Americas, six from Europe and one each from Africa and Asia. "I want to see Zinedine Zidane, David Beckham, Brazilian Ronaldo," said Jorge Campos, 48, the flamboyant ex-Mexico goalkeeper who will coach his country. Campos, who played in the 1990s, told BBC World Football: "Everybody wants to see Argentina's Diego Maradona, but he can't play. He's too old." Tamer Al-Saoud, from the competition's executive committee, said it will give fans a chance to relive their yesterdays. "It's all about reviving history," he said. "Taking your kid, who's grown up seeing the likes of Cristiano Ronaldo and Lionel Messi, and showing them that we had ex-Germany captain Lothar Matthaus and the original Ronaldo." Do you agree with BBC Sport's living legends XI selection?